Mr. Everyday Dollar has a confession: he loves pizza! Some may even call him a pizza eating machine. He could eat pizza for breakfast (with coffee) and be in absolute heaven. That’s a good chunk of change and doesn’t even include a movie yet! One of my favorite things to make at home is pizza. I am going to give you all my secrets to making pizza that is just as good, if not better, than the margherita pizza I’ve been happy to fork over $9.50 for. First, I assume you have an oven. If so, you are off to a great start! I like to use a pizza stone and pizza peel. I have had these items for awhile and if you buy quality ones, they will give you years of great pizza making service. I have a rather generic peel that I don’t even remember where it came from (either this metal one or less expensive wood one would suffice) and I have this superb 16-inch pizza stone . If you don’t want to invest in a pizza stone, you can use a much cheaper half-inch quarry tile. Just be sure it is unglazed, as a glazed one would definitely have chemical coatings you do not want. I didn’t want to risk using a potentially non-food grade quarry tile, glazed or unglazed, so I opted for the pizza stone. A food processor or blender for making sauce. I usually make margherita pizza but the options are endless. 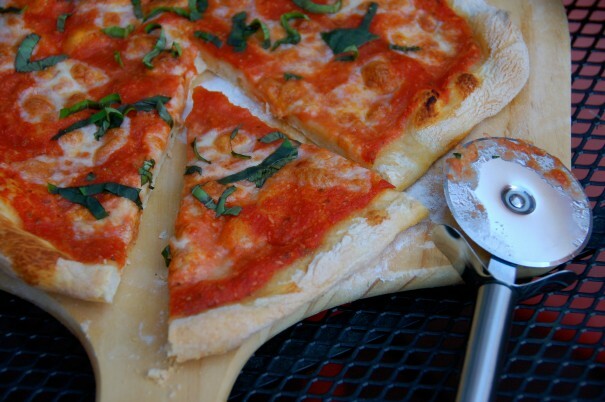 I like the margherita because it’s simple and delicious. Win. 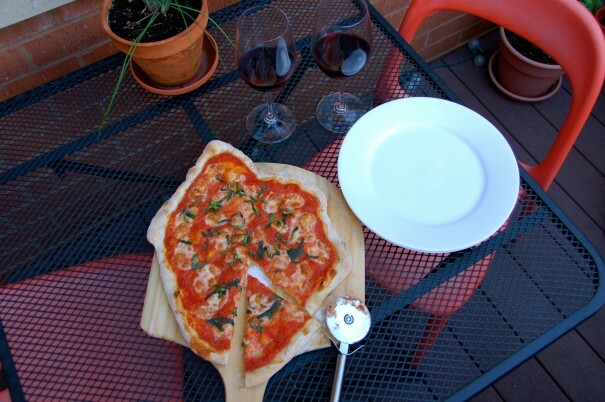 Pizza dough – can be a store-bought ball, otherwise make your own with this recipe. Sauce – in a food processor, blend a 28-oz can of plum tomatoes, 1-2 garlic cloves, a pinch or two of sugar, basil, oregano, salt and a drizzle of olive oil, tasting as you go to get it just how you want. Fresh basil – as a topping after the pizza comes out of the oven. I have a small basil plant I harvest from. 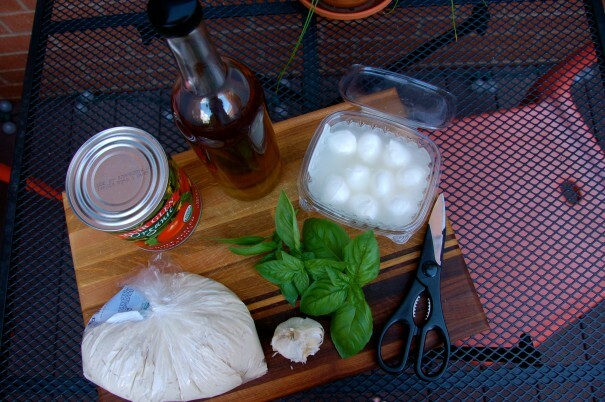 Mozzarella – Use fresh mozzarella balls. These hold a lot of moisture, so be sure to press them into a paper towel to remove excess liquid. Crank the oven to its highest setting (mine goes to 550 degrees) and have the pizza stone on the lowest rack. If using a dough ball from the store, I split it into 2 balls and on the floured peel, I punch the ball down making sure I get all the air bubbles out. It’s about 8 inches after this. I then stretch the dough by picking it up by the edge and quickly moving my hands around the perimeter, letting gravity pull it down. I end up with about a 16-inch disk after this. Add a layer of sauce and slices of mozzarella. Slide the pizza from the peel onto the stone in the pre-heated oven. Bake the pizza until the cheese starts to melt, usually 3 or 4 minutes, then turn the oven to broil to brown the top. The pizza is done when the cheese is fully melted, bubbling and starting to show signs of browning. The crust will be golden brown. Remove pizza, let cool for a few minutes, cut it into slices and enjoy! What’s the difference between going out to eat for pizza and wine and making the same thing at home? Restaurant $47.15 – Home $12.63 = $34.52 in savings! Think about this every time you are about to shell out your dollars at that restaurant!